We’ve all found ourselves left with a hodgepodge of extra veggies at the end of the week. Making a weeknight stir-fry is an excellent way to make good use of those orphans. 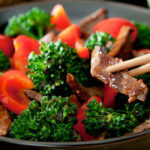 This healthy Beef and Broccoli with Red Bell Pepper stir-fry gets its vibrant color and a boost of vitamin C from red bell peppers and rich flavor from a ginger soy glaze. This versatile beef and broccoli recipe tastes phenomenal with bell peppers, garlic, and fresh ginger. Bok choy, asparagus tips, and crisp water chestnuts would all work well in this dish.